Gina Neff, Assistant Professor, studies the relationship between society and communication technologies, as well as between culture and communication. Her research focuses on (1) how work, communication technologies, and organizational structures relate to one another and (2) the commercial production of mediated culture in communication industries. 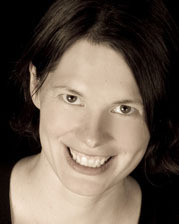 Her current research projects include a book manuscript entitled Venture Labor on work and discourses of risk in high-tech firms, a project on internships and the entry-level labor market in communication industries, and on-going documentation of organizational challenges that high-tech and innovative industries face. She holds both a Ph.D. in sociology and a B.A. in economics and Middle Eastern Languages and Cultures from Columbia University. Technology is forcing new ways of working with and through media—ways that challenge organizational and institutional power and are at their heart rooted in a politics of the workplace and a politics of the economy. There is a hard technological determinism that motivates many decisions in the business world. In academia we need to begin to think seriously about this meme that technology “fixes” things, without losing sight of our theories on the social construction of digital culture and on mutual shaping of technology and society. We also need to develop a political economy of communication that can seriously incorporate changes to both media labor and mediated labor, theorizing simultaneously both changes in media production and in workplaces when new tools are introduced. Democratic access to the means of media production isn’t the same as democratic participation in media production. The concerns of equality in the creation, reproduction and distribution of culture remain vitally and politically relevant in a digital environment.